George Orwell’s chilling dystopian novel is best remembered for the features that have seeped into our contemporary cultural consciousness: Big Brother, Room 101, the Thought Police. But perhaps the real key to Nineteen Eighty-Four lies in its final, often overlooked pages. 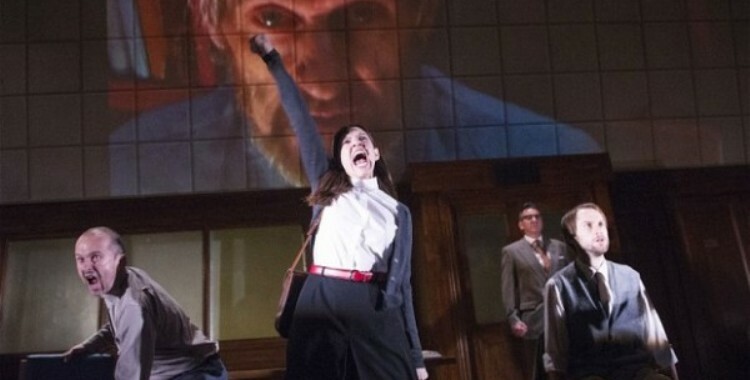 In Headlong’s bracing new version, adaptors Robert Icke and Duncan Macmillan use Orwell’s typically discarded Appendix as a means of re-examining his entire narrative, offering – in what sounds like a perfect instance of doublethink – an extraordinarily faithful transformation of the text. Orwell’s dry, formal Appendix, entitled ‘The Principles of Newspeak’, begins with the seemingly innocuous words “Newspeak was the official language of Oceania”. Realising, like Orwell, the huge difference contained in a change of tense, Icke and Macmillan latch onto that crucial “was” and hang upon it their entire adaptation. In their nightmarish rendering of this dystopia, past, present and future are slippery, fluid categories, bleeding into one another before our eyes. What we are left with is the blank, continuous present that the Party envisioned, where the notion of history has been all but abolished. This is achieved through the canny addition of a framing device, which tackles the troublesome Appendix by way of a book group interrogating Winston Smith’s tale. Imagining Orwell’s novel as an artefact, this structural flourish puts Winston’s experiences in direct dialogue with the future he hoped to speak to when starting his diary. And yet, in a conundrum that reveals the central problem of the Appendix itself, this textual artefact is not in fact Winston’s diary, but a third person account of his rebellion and suppression. How, then, has this document survived? Who has written it? And if it really has survived, who has allowed it to survive? These questions are persistently posed by an adaptation that strikingly reconfigures Orwell’s text in service of a searching examination of what it is doing. Through an unsettling temporal slippage, the future framing of the narrative exists directly alongside Winston’s hatred for the party, his ill-fated love affair with Julia and his horrifying ordeal at the hands of the Ministry of Love. The world this structure creates is one where no firm foothold can be made on either the past or the future, one where uncertainty is the only constant, one where – most importantly – no document can be trusted. The theatre, where a kind of doublethink is constantly in play, is the perfect arena for this dizzyingly intelligent interrogation of truth and fiction. Here, we are always caught in the process of accepting that an object on stage is at once one thing and another, a function of theatrical metaphor that Icke and Macmillan’s production repeatedly exploits. Mark Arends’ haunted, disorientated Winston always creates the impression of being both here and not here, dislocated from linear time. “Where do you think you are?” he is repeatedly asked, to which the answer is always bewilderment. As well as the crossover between temporalities and characters, Chloe Lamford’s inspired set design epitomises this relentless doubling. The first part of the show is contained within a bland office space, all non-descript chairs, wood panelling and boxes of files. This serves as both the setting for the book group and the backdrop of Winston’s existence, demanding metaphor in order to function within the narrative. The only area external to this space is Winston and Julia’s short-lived retreat, which is at once hidden and exposed; it exists off stage, beyond our immediate gaze, but it is revealed to us via video footage on screens, putting us in the position of the ever-vigilant eye of Big Brother. In the final third of the show, meanwhile, this design achieves a breathtaking transformation, stripping away tangible referents in a process that mirrors Winston’s struggle to hold onto memory and reality, yet still refusing to fix itself on just one, determinable location. And it does not stop with the design. Every last element of this production, from the discordant strains of Tom Gibbons’ sound design to Natasha Chivers’ accomplished lighting, which ranges from the unsettlingly anaemic to the blindingly bright, contributes to a disquieting atmosphere of uncertainty and uprootedness from time. We, like Winston, have nothing solid to grasp onto. With Chelsea Manning, the NSA and Edward Snowden still dominating headlines, we hardly need reminding of the continued and disturbing resonance of Orwell’s 1949 novel. Headlong’s startling new production, however, suggestsNineteen Eighty-Four’s prescience in another, deeper way. Orwell’s vision, Icke and Macmillan reveal, penetrated beyond the structural framework of surveillance, right down to the disorientating experience of modern life under late capitalism. Like all the worst nightmares, its chill emanates from its uncanniness.